Sunday brunch is quickly becoming a time to gather friends and family, and I love it. Not that I don’t like dinners and barbecues, but who doesn’t want another excuse to have breakfast food? Plus brunch means you can put pretty much anything on the menu from anytime of day, and it all works. 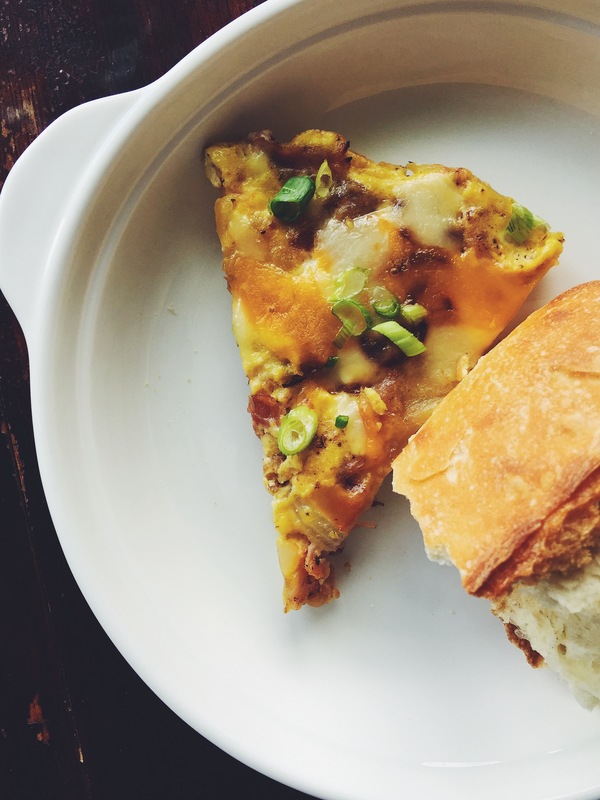 A favorite in our house is the Spanish Tortilla. 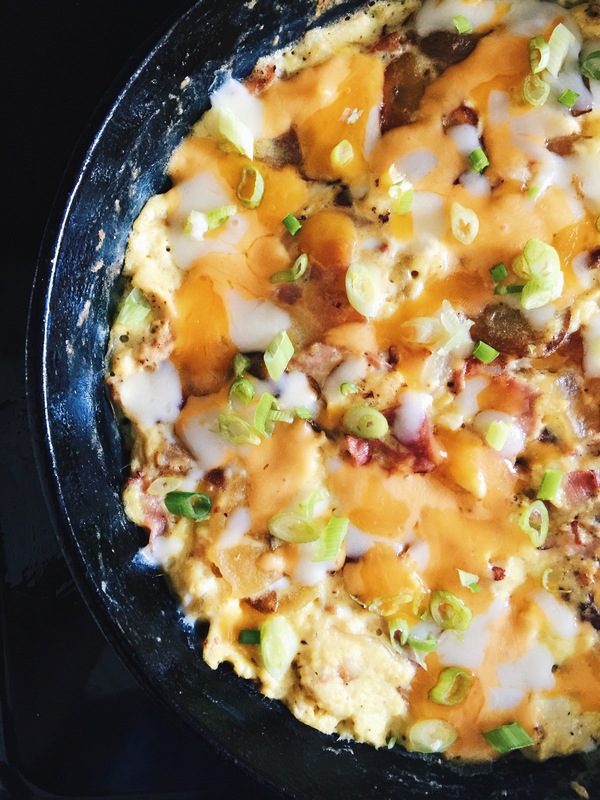 Sometimes called a frittata, it’s an easy main dish featuring eggs, potatoes, cheese, ham, and a few veggies. 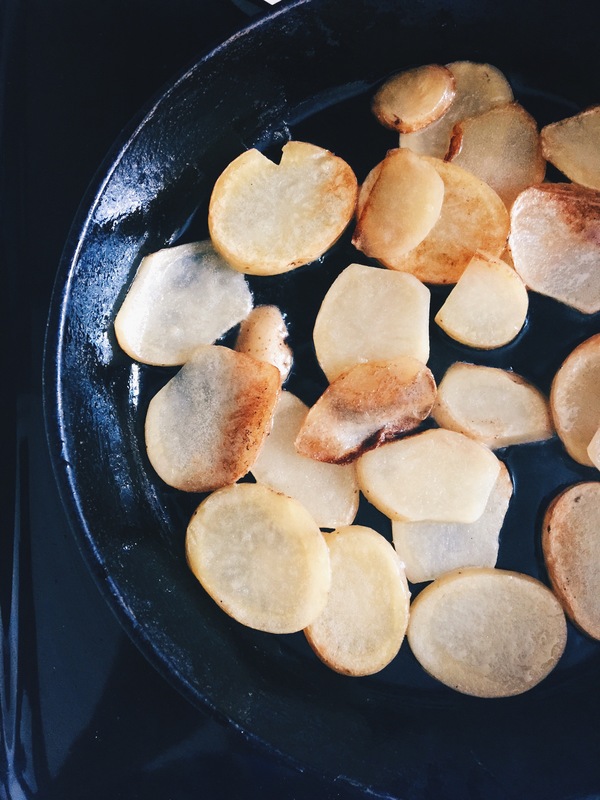 It’s a great way to use up a half an onion or a little bit of cheese, but it fills people up thanks to the potato. Best of all, you can serve it right from the skillet, and you probably have most, if not all, of the ingredients on hand. Place oven safe skillet over medium heat. Heat 3 T. oil. Add potatoes and sliced onions, stirring gently (you don’t want to break the potatoes) until onions are soft and potatoes are tender, about 5-7 minutes. Meanwhile, combine eggs, milk, and a little salt and pepper in a bowl. Beat with a fork or whisk to mix. Set aside. 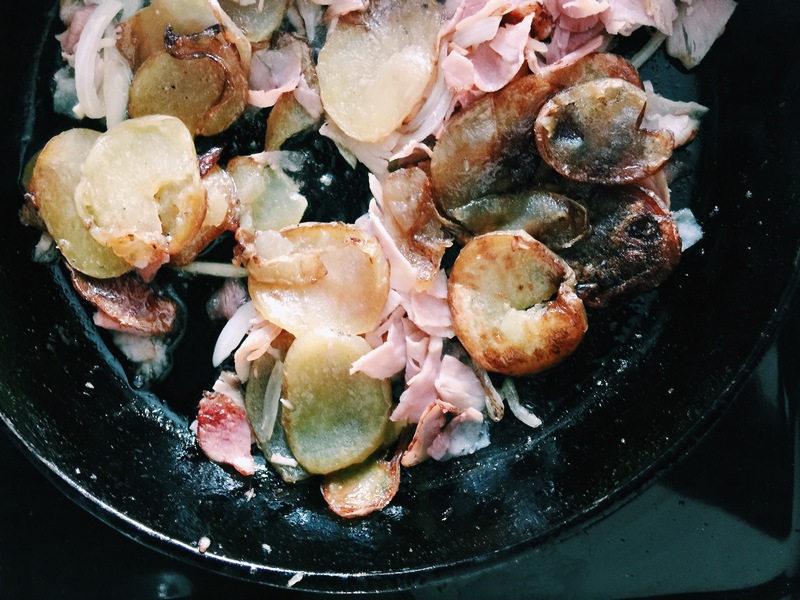 Once the potatoes and onions are soft, add in ham and heat through, about 1 minute. If the skillet is dry, add another tablespoon of oil. Carefully pour the eggs into the skillet and stir gently with a silicone spatula, just until the eggs begin to scramble slightly. Place skillet in preheated oven and cook until eggs are just set, about 5 minutes. You want the eggs to look slightly underdone, since they will continue cooking as it sits. Sprinkle on the cheese and cover, letting the residual heat melt the cheese. If using, garnish with sliced green onions, and slice into 4-6 wedges to serve. There are so many variations on this dish! Add almost any vegetable, meat and cheese combination; they will probably work! Try sausage instead of ham, add mushrooms with the sliced onions, and make the cheese Swiss = delicious! If you’re on the go, serve it sandwich style on some crusty bread, the way a little shop in Spain served it. Husband-face had it that way there and he was hooked! However you choose to make and serve it, I hope it’ll be a welcome addition to your brunch menu, and it makes a fast weeknight meal paired with a green salad. Breakfast for dinner is never a bad thing in my book!